A box can be filled with almost anything. 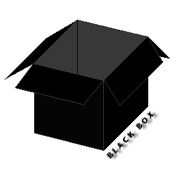 Black Box is filled with smart, creative solutions; sound marketing strategies; and the latest technological advances. Black Box is a design firm located in Emmaus, Pennsylvania, specializing in enterprise level, web-based solutions. Since 1994, the combined talents of our team have produced numerous print pieces, identity programs, advertising campaigns and multimedia presentations, as well as commerce and marketing web sites for companies such as Polo Ralph Lauren, Tory Burch, MTV, Viacom, Acxiom, Calvin Klein, Pepsico, The 4H Foundation, The National Trust for Historic Preservation, Binney & Smith (makers of Crayola products), and Rodale Press, among others. Now in our third decade, we are focused on creating custom web-based and mobile applications that enable large organizations to streamline their processes and optimize resources.